A very handsome, late Victorian, pine front door. The door is hand made with mortise and tenon joints and has very attractive raised and fielded lower panels. The top of the door has a lovely arch topped panel, ready for glazing. The door is stripped to bare wood and is ready for finishing with oil, paint or varnish. We can glaze the door, repair the letter box area and supply a letter box for an extra charge. Please contact us for further details and a quote. The door is in solid condition but is antique and has had several repairs. The patch repairs and filler can be seen and therefore the door may be best suited to a paint finish. There is repaired damage to the upper mid rail and some knocks, chips and signs of wear. There are some holes and marks where the hardware has been removed. 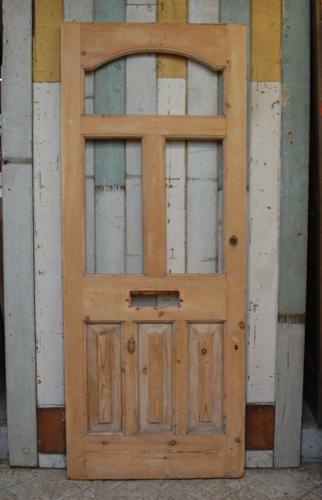 The door has an abundance of character, with very nice period detailing, making it a very desirable item.